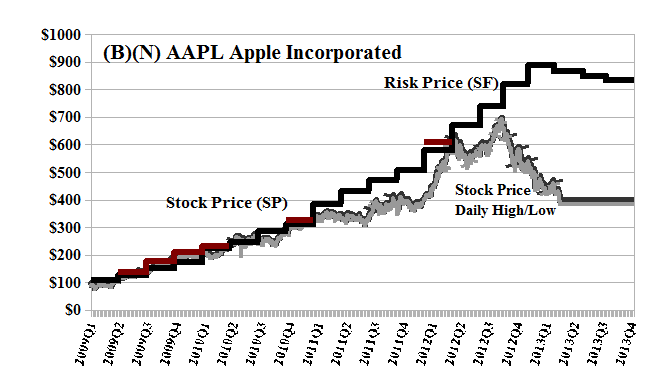 (B)(N) AAPL Apple Incorporated – One More Time? Drama. We were hoping that we would never have to talk about Apple Incorporated again. It’s just a show, don’t you get it (please see our Post, Microsoft, Apple, Google & The Tech Wars, February 2013)? And it wasn’t Apple that bid up its stock price to nearly $700 per share and a market value just short of the combined market value of Exxon ($400 billion), General Electric ($250 billion), and IBM ($225 billion). And some experts were thinking, or burbling, maybe, even, about $1,000 per share this year. Of course, anything can happen and we can be struck by lightning twice, for example (Reuters, April 19, 2013, Wall Street Week Ahead: In earnings frenzy, will Apple get crushed?). We don’t know whether Apple is going to get crushed next week, but we haven’t been juiced up about it for quite some time (please see Exhibit 1 below) because we know that the market itself enforces a balance, all of the time, between “risk seeking” investors and “risk averse” investors, of which the former might make a lot of money from each other, fast, but can also get crushed and burned, fast, and fast again, and fast again … and then complain about it (Reuters, February 7, 2013, Einhorn sues Apple, marks biggest investor challenge in years)? Well, they ought to read our Posts once in a while. On the plus side, it pays a dividend of $10.60 per year, or $9.9 billion, to its shareholders for a current yield (at $390) of 2.7%, and one would think that the company might really be a $300 to $400 company, indefinitely, based on its margins and operating profits, total assets of $200 billion, net worth of $127 billion, and contributing plant & equipment of $16 billion net of an accumulated depreciation of $8 billion. That looks like a company, to us, and an even better one at $300. For more detail, please see some of our previous Posts on Apple and the other guys. Apple Incorporated designs, manufactures, and markets personal computers, mobile communication devices, and portable digital music and video players and sells a variety of related software, services, peripherals, and networking solutions.